Egypt's foreign ministry spokesman Ahmed Abu Zeid said on Thursday that Egypt is "deeply concerned" by the state of polarisation within the UN after Tuesday's chemical attack in the Syrian town Khan Sheikhoun. Abu Zeid said that Egypt, a non-permanent member of the United Nations Security Council, is sorrowful that the suffering of the Syrian people is being "held hostage" by disputes in the UN. The Security Council held an emergency meeting on Wednesday to discuss the attack but differences among superpowers on who to blame for the attack has prevented the council from writing a draft resolution. Britain, France and the United States, who have accused the Assad regime of responsibility for the massacre, pushed for a resolution demanding a swift investigation into the attack. However, Russia, which backs the Damascus government, has stood by Assad's claims Syria did not use chemical weapons against anyone. 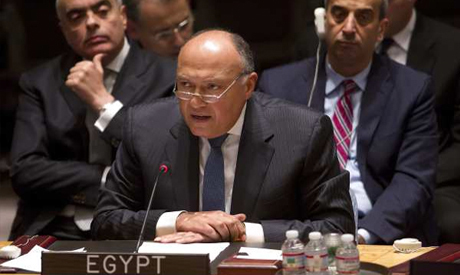 "This state of polarisation is undermining the UN's capacity to end the suffering of the Syrian people," said a statement by the Egyptian foreign ministry, which stressed that Egypt deals with any international decisions on Syria by considering the interests of the Syrian people. At least 86 civilians, including at least 20 children, and 546 wounded were killed in the chemical attack in the rebel-held Khan Sheikhoun town in Syria's northwestern Idlib province. Dozens more victims were left gasping for air, convulsing, and foaming at the mouth, according to doctors on the scene. The council is expected to reach a decision on the resolution on Thursday. On Wednesday, Egypt condemned what it described as the "indiscriminate bombardment" of Khan Sheikhoun. The Egyptian foreign ministry said that the "painful and unacceptable" images of the massacre reaffirm the necessity of reaching a political solution to end the crisis in Syria, in line with the international community decisions and the Geneva Conventions. The Kremlin stressed in a statement on Thursday "the unacceptability of making unfounded accusations against anyone before a thorough and impartial international investigation is carried out." Moscow, which has troops in Syria in support of Assad's forces, said the deaths were caused when a Syrian air strike hit a "terrorist warehouse" containing "toxic substances." Syrian foreign minister Walid Muallem said on Thursday that "the Syrian army has not, did not and will not use these kinds of weapons – not just against our own people, but even against the terrorists that attack our civilians with their mortar rounds," according to AFP.